"We are on assignment from Galactic Center. We have all manifested in three dimensions and assumed bodies to explore reality on planet Earth." So begins the liner notes in the debut CD from the Californian husband and wife team of Rebecca and Michael Vest, known as Space Babies. I was quite charmed by this album of trippy folk, pop and rock tunes. 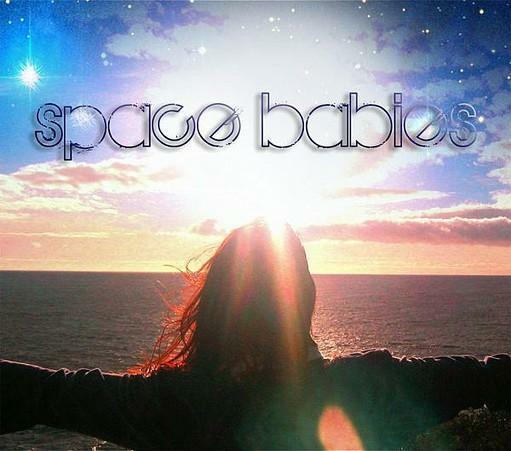 Space Babies' music is like a blend of the cheerfully whimsical craziness of British psychedelia riding on a wave of dreamy 70's style soft rock. At times these songs almost seem to touch the transcendental, playfully teasing the listener, drawing out the child within. But like those great psychedelic albums of yore, this is the kind of music that could appeal to both younger and older listeners, or as the Space Babies say themselves, "music for fairies, elves, meditators, relaxers, desert drivers, cosmic explorers and children of all ages." The album opens with a dazzling rush in the form of I Feel Amazing. For some reason I tend to associate this song with the album cover art. Perhaps it's because it was the first song I listened to while perusing the cover, but I think it's more because of that 'spreading your arms wide to embrace the new day and the cosmic greatness of everything' feeling it fills you with. It's a great, spacey (and definitely catchy) anthem that sets the positive tone of the album perfectly. From then on there are many ace moments, from the laidback Jimmy Buffet in outer space cosmic geniality of Spaceship Earth to Big Wave, an astral soft rock, surf tune with a quantum physics twist. The duo seem comfortable with many different styles, adding to the album's phantasmagorical nature with the world beat folkiness of Wild Heart, the Latin groove jazz of Where Are You Now and the chilled out dub trip of Space Baby. It's all part of the fun though, whether it's the silly psychedelic pop of Secret Passage, which could have easily been a lost Magic Mushroom Band tune to the more serious, electronica driven space rock of Earthstar. The lyrics of the songs blend psychedelic imagery with sci-fi weirdness, eco-consciousness and cosmic, spiritual love for an overwhelmingly positive message that can't help but put a smile on your face. So if you're a space rock fan looking to bring your kids along on the cosmic voyage with you, or just someone who enjoys psychedelic folk pop painted with all the colors of the rainbow, this is a great album for you. Come on and ride the big wave!